The Program is supported through the contribution of dues. Dues go directly to the Fellows Program to support the engagement of our Fellows through such activities as providing peer review services for grants, enhanced recognition, involvement in public policy, increased opportunities to publish in the NAI Journal, special symposia, and more. Thank you for your support of this important initiative as we continue to honor and recognize future generations of the nation’s prolific academic inventors across our nation and around the globe. Fellowship dues are separate from the membership dues paid by the institutional member. Fellowship dues are assessed to the individual Fellow on an annual basis. All dues are used to directly support the Fellows Program and assist in honoring and recognizing future generations of top innovators. Invoices for NAI Fellows Dues will be issued annually in June to all Fellows (with the exception of those who elect Lifetime Fellows Membership). Upon payment, annual dues cover active membership from July 1 through June 30 each year. Failure to pay dues will result in a loss of NAI Fellows Program benefits. Online: For quick and easy dues payment by credit card, request an electronic invoice. National Academy of Inventors, Inc. In recognition of their outstanding accomplishments, honorees are presented with a signature trophy, medal, and custom rosette pin during the induction ceremony. 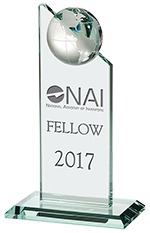 The NAI Fellows Trophy is an iconic glass piece which displays the Fellow’s name and year of election. At the top of a trophy, a globe is displayed to represent the significant impact the contributions of NAI Fellows have made on our world. Another symbol of prestige is bestowed upon NAI Fellows through the rosette pin designed and crafted by Dexter Rosettes, Inc. The rosette dates back to 1802 when Napoleon Bonaparte instituted its use as a part of the Legion of Honor award. Rosettes today are used for various reasons including symbolizing excellence and an association with a specific organization. 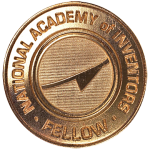 The NAI Fellows Logo and Seal were designed by a committee of Fellows. This logo and seal are for the exclusive use of elected NAI Fellows to denote their status of this high honor. The below files are available for download and use solely by Fellows of the NAI.